Pierre Jaquet-Droz was born in 1721 on a small farm (La Ferme de Sur le Pont) in La Chaux-de-Fonds. He began to take a serious interest in clockmaking and precision mechanics under the tutelage of older relatives from the Brandt-dit-Grieurin, Sandoz and Robert families. It proved to be a true revelation for him. From 1738 to 1747, Pierre Jaquet-Droz devoted himself entirely to clockmaking. He produced a series of longcase (or “grandfather”) clocks whose increasingly sophisticated movements outclassed anything that had yet been produced. His manual dexterity, meticulous nature and serious approach to his craft, as well as the reasoned application of mechanical principles, led him to enhance his watchmaking movements with music and automata. Within no time, his creations had caught the attention of a wealthy and demanding clientèle. By the time he married Marianne Sandoz in 1750 he was firmly established in his profession. Soon after the birth of his two children, Julie in 1751 and Henri-Louis in 1752, Pierre Jaquet-Droz lost his wife, followed by his daughter in 1755. He never remarried, devoting himself entirely to clockmaking. In an encounter that would change the course of his life and prove decisive to his international career, he met George Keith, Earl Marischal, governor of the principality of Neuchâtel, who advised him to present his creations abroad, especially in Spain where he could help introduce him to the court. With this support, Pierre Jaquet-Droz, his father-in-law and a young hired hand named Jacques Gevril, built a carriage specially designed to carry six clocks and set off for Spain in 1758. Leaving Switzerland behind them, they traveled for 49 days and were received in Madrid by Don Jacinto Jovert, a Spanish nobleman. After a wait of several months, Pierre Jaquet-Droz presented his clocks to King Ferdinand VI of Spain. The presentation was a triumph; the monarch and his court were dumbfounded at the sight of a clock that could strike on request without needing manual intervention. A few days later, the clockmaker received 2,000 gold pistoles in payment for the timepieces that he had brought to Spain, all of which were purchased for the royal palaces of Madrid and Villaviciosa. Upon his return to La Chaux-de-Fonds in 1759, the large sum of money he had brought back from Spain enabled Pierre Jaquet-Droz to concentrate exclusively on making watches and clocks and the automata that were to make his name. He set to work, assisted by his son Henri-Louis and a neighbor’s son, Jean-Frédéric Leschot, whom he had taken in after the death of the boy’s mother and thought of as his adoptive son. This was the beginning of a close and fruitful partnership. From 1773 onwards, Jaquet-Droz and Leschot perfected and marketed increasingly sophisticated automata. Their work culminated with the three humanoid automata: The Writer, The Draughtsman and The Musician, presented in La Chaux-de-Fonds in 1774. These three masterpieces, admired by connoisseurs from all over the world, consolidated the reputation of Pierre Jaquet-Droz and the success of the business. Encouraged by this success, the Jaquet-Droz family took to the road to exhibit their fabulous creations. From La Chaux-de-Fonds they traveled to Geneva and then, in 1775 to Paris where they presented the automata to Louis XVI and his queen, Marie-Antoinette. They went on to show them at the principal courts of Europe, with visits to London, Holland and Flanders in 1780 and 1781, as well as northern France. They returned to Paris in 1782 and 1783, and traveled to Lyon in 1784. The automata were also demonstrated at the Russian court in Kazan, in Madrid and beyond. EIn 1774, Pierre Jaquet-Droz decided to set up a workshop in London, a hub for industry and trade, under the management of his son, Henri-Louis. Completely exhausted by his travels, the latter delegated some of his responsibilities to Jean-Frédéric Leschot. Leschot was tasked in particular with overseeing the business relationship with the prominent trading company James Cox London, whose agents in Canton opened up the Far Eastern market for the Jaquet-Droz Company and for many years represented it in China, India and Japan. Pierre Jaquet-Droz always had a passion for nature and birds which he transcribed through his clocks, snuff boxes, pocket watches and automata. With more than 600 pieces exported to China in 10 years Jaquet-Droz father and son captivated the Qianlong Emperor himself and the Mandarins at the Imperial Court, who all had a keen interest in European mechanical watches and automata. It was the first clockmaking brand to be imported there. Several Jaquet-Droz automata and pocket watches are still carefully preserved in the Imperial Palace museum today. Orders continued to flow in from all over the world. Pierre Jaquet-Droz set up a team of the best watchmakers to be found in the Neuchâtel Mountains. From 1783, management of the London operation, established in the Bartlett’s Building, was turned over to a new business partner, Henry Maillardet. The Jaquet-Droz family supervised the work of a long manufacturing chain (clockmakers, chasers, jewelers, enamellers, painters and musicians) and handled the administration and the commercial side of all their businesses. For some ten years, the company continued to expand. It sold clocks, automata, watches and singing birds all over the world, especially in China. But the harsh climate of La Chaux-de-Fonds and the insidious London fog was detrimental to Henri-Louis’ precarious state of health. In 1784, he decided to move to Geneva, finding its artistic and literary life to his taste. Jean-Frédéric Leschot soon joined him and they decided to open the city’s first clockmaking manufacture, simultaneously introducing the production of timepieces featuring grand complications. The talent and interest shown by Henri-Louis Jaquet-Droz and Jean-Frédéric Leschot in the civic life of Geneva was quickly noted and approved of. The City of Geneva presented both of them with the coveted Bourgeois d’Honneur Award, and welcomed their involvement in municipal activities. Jaquet-Droz was admitted to the newly reinstated Société des Arts, and was very active in the advancement of technical training. He helped set up a factory-school in Geneva to make cadratures for repeater watches and developed many projects bearing on watchmaking technique and advocating the professions associated with watchmaking. Pierre Jaquet-Droz moved into the house of a clockmaker named Dental, at the corner of Rue Molard and Rue du Rhône, which housed the workshops and his son’s apartment. In 1784, Pierre and Henri-Louis Jaquet-Droz headed three production and profit centers: one in La Chaux-de-Fonds, a second in London as well as a third in Geneva dedicated to low-volume watchmaking production. 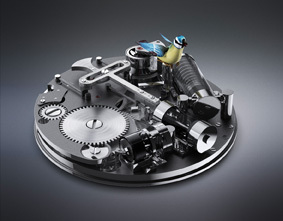 After moving to Geneva, Jaquet-Droz & Leschot specialized in the manufacture and export of luxury watches featuring automata, musical mechanisms or other complications, in the meantime developing their production of singing birds. Sales were handled by agents in France for the most part, but also in London and Canton. In 1788, the success and prosperity of Jaquet Droz & Leschot peaked, but this period was of short duration. In 1790, drafts made on their principal correspondent in China came back unpaid and their main client in London failed, putting the company in the red. The partnership with Henry Maillardet had to be liquidated. These misfortunes darkened Pierre Jaquet-Droz’s final years. He left Geneva to live in Bienne, Switzerland, where he died in 1790. His son died the following year during a trip to Naples with his wife. He was only 39 years old. Given the disastrous economic repercussions of the French Revolution in 1789 and the conflicts that arose as a result, the business, now headed by Jean-Frédéric Leschot, ran into serious financial difficulties. He continued to make high-priced watches, snuffboxes and singing birds, but had to show great prudence: customers were notified that he now preferred to be paid cash on delivery and would no longer sell to faraway markets. The Napoleonic Wars, which pitted France against nearly every other nation of Europe, put an end to prosperity for the nobility and well-to-do bourgeoisie. The Continental Blockade, decreed by Napoleon in 1806, killed off any remaining market for very luxurious objects and greatly inhibited trade with England. For Jaquet-Droz & Leschot, this was the end of a period of great creativity and prosperity. Montres Jaquet Droz is acquired by the Swatch Group and joins its prestige and luxury group. The Swatch Group enables the brand to recapture the success it enjoyed during the Age of Enlightenment and preserve the exceptional heritage of its founder. 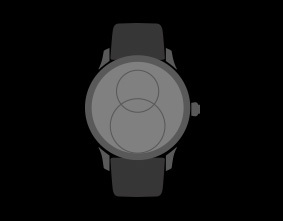 The Group makes its expertise, technical resources, renowned production system and its international distribution network available to Jaquet Droz. 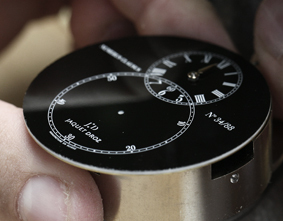 Launch of the Grande Seconde, a piece inspired by a pocket watch created in the 18th century. The dial of this ageless icon of the company is a refined demonstration of the art of Grand Feu enameling, with the hour and minute display at 12 o’clock overlapping the seconds counter at 6 o’clock. Launch of the Pocket Watch, that has been the legendary timepiece icon of Jaquet Droz for centuries. This model, created in 1785 still with us today, has become the inspiration for the brand’s flagship, the Grande Seconde Enamel, honoring a philosophy that has remained unchanged since the Age of Enlightenment. Nicolas G. Hayek takes the reins at Jaquet Droz, assisted by a steering committee. Marc A. Hayek takes over at Jaquet Droz, with the firm intention of cultivating the spirit of excellence and innovation while continuing to respect the emotional and poetic values that date back to the 18th century. Montres Jaquet Droz SA moves into its Fine Watchmaking workshop in La Chaux-de-Fonds. This 2,500 m2 site gives the brand a new energy and the intention of becoming, like its watches: a synthesis of horological expertise and craftsmanship with a distinctive personality that enables it to meet the strong demand from the market and its customers. The Launch of the Eclipse, an exceptional timepiece displaying 8 stars (a lucky number for Jaquet Droz) and an engraved moon that continuously evolves, changing with each new dawn. This 18th century inspired design evokes both the origins of the brand and its passion for the decorative arts that dates back to the Age of Enlightenment. One of the most recognizable Jaquet Droz models, the Grande Seconde, is combined with a masterpiece of high-precision watchmaking - the tourbillon. Sapphire and Grand Feu enamel, innovation and tradition... many creative possibilities are opened up. The master dial makers finally decide to place the tourbillon right at the heart of the seconds counter, repositioned at 12 o’clock. Jaquet Droz makes it a priority to develop its Ateliers d’Art within the Fine Watchmaking workshop in order to integrate and preserve the centuries of special expertise that define the brand’s identity. The meticulous work involved in miniature painting, carving, engraving and paillonnée enameling is highlighted in some exceptional pieces in the Jaquet Droz collection. With the support of the Musée d’art et d’histoire of Neuchâtel, the famous humanoid automaton, the Writer, is taken to Beijing as part of an extraordinary exhibition “Automates & Merveilles”. 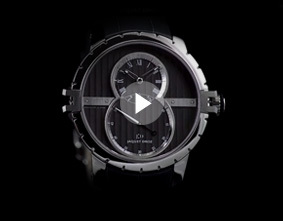 In partnership with Montres Jaquet Droz it introduces the genius of Jaquet-Droz and Leschot to a new public. 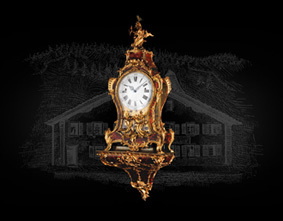 An incredible amount of information is assembled for the first time in the three museums in the canton of Neuchâtel: the Musée d’art et d’histoire of Neuchâtel, the Musée d’horlogerie of Le Locle and the Musée international d’horlogerie in La Chaux-de-Fonds. For many years, whether on the canvas where the painter brings his work into being or the dial where the sculptor applies his relief decoration, Jaquet Droz’s workshops have paid homage to birds and brought them to life. 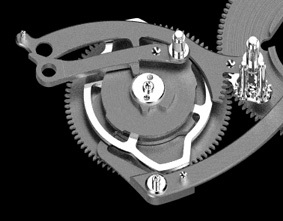 A new automaton, The Bird Repeater, is presented in November. This exceptional piece that involves all the decorative arts has been created in-house, demonstrating the history, expertise and imagination of Jaquet Droz craftsmen. Jaquet Droz celebrates its 275th anniversary, maintaining the avant-garde spirit and refined taste that distinguishes its founder. After almost 300 years, the link between the Age of Enlightenment and the third Millennium remains intact. At this occasion, the brand inaugurates an exceptional exhibition in Shanghai then travelling around the world and taking the opportunity to unveil to the public the first singing bird automaton on a wristwatch ever created: The Charming Bird. Years of research into mechanisms culminated in a veritable technical feat. Jaquet Droz succeeds in combining the automaton that had made the brand’s name in the 18th century with fine watchmaking techniques to produce a miniature singing bird nestled in a timepiece with unequivocally contemporary lines. Two years later, the masterpiece wins the Grand Prix d’Horlogerie de Genève in the “Mechanical Exception” category. Jaquet Droz goes a step further with “The Signing Machine” an amazing automaton that is profoundly of its time. 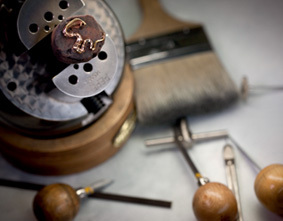 By means of highly complex movements, driven by a set of cams that are handmade in order to produce a fluid, natural script, The Signing Machine duplicates its owner’s signature. That same year, Jaquet Droz writes a new chapter in the history of the Grande Seconde by adding a silicon spiral in the escapement of its movement and revisiting its aesthetics. 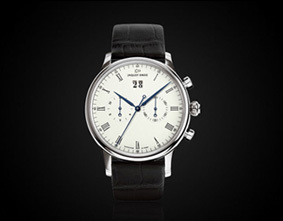 The Grande Seconde Quantième Ivory Enamel makes its first appearance. The brand known by its twin stars reaches the pinnacle of achievement, bestowing the Lady 8 with a breathtaking mechanical animation in the form of a blossoming lotus flower. The Lady 8 Flower is the expression of refined femininity enhanced by the astounding automaton and the virtuosity of the Jaquet Droz Ateliers d'Art. Moreover, the brand continues to develop its Ateliers d’Art to keep surprising observers and to perpetuate ancestral skills. A workshop specially dedicated to automata is also now well worth discovering. At the same time, Jaquet Droz renews a focus on a highly confidential complication: the Grande Seconde Deadbeat. An extremely rare complication and masterpiece of precision watchmaking, the deadbeat second was created in the eighteenth century and has been reinterpreted in 2015 in the brand's iconic watch: the Grande Seconde. During the course of Baselworld 2016, Jaquet Droz is showcasing once more the art of astonishment through exceptional novelties such as the Petite Heure Minute Thousand Year Lights, the Grande Seconde Off-Centered Onyx and the Grande Seconde Dual Time that extends the iconic Grande Seconde collection with an added complication. A rendez-vous with emotion: like Gauguin’s exotic paintings, this is an invitation to faraway places and delights for the senses. The Tropical Bird Repeater watch – the only one of its kind in the world – brings together all the watchmaking and decorative expertise of the brand known by its two stars. A piece destined for discerning collectors, the Tropical Bird Repeater is part of a long history at Jaquet Droz, honoring the Enlightenment-era passion for nature and animals of founder Pierre Jaquet-Droz. Automatons, along with the Ateliers d’Art, represent two of the eight codes of the La Chaux-de-Fonds manufacture, hand-decorated here by engravers and miniaturist painters. 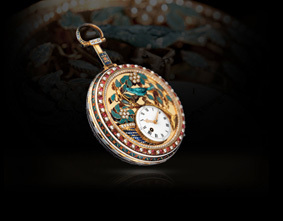 These codes are indispensable to the creation of this scene with its flamboyant colors that emerge like a lush oasis on a mother-of-pearl dial, itself enclosed in a red gold case adorned on the sides of its lugs and on the middle band with an animal motif hand-engraved by the brand’s craftsmen.